Terrain: Mostly level ground, but with two moderately steep hills. The route includes minor roads, a short(ish) stretch of the A35, a bridleway and areas of open New Forest land that, particularly in winter and early spring, can be wet and muddy. Strong boots are therefore recommended. Please also note that the route close to Highland Water features a number of side-streams that have to be stepped or jumped across, and that floodwater can reduce the relevance of the walk instructions in Sections 5 and 6. Distance: 8.5 kilometres (5¼ miles). 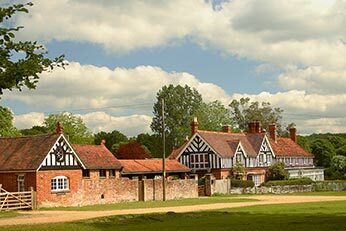 Lyndhurst’s outlying hamlets enjoy a rich and varied history. Richardson, King and Driver on their late-18th century map of the New Forest show Pikes Hill as Pigs Hill, for example; whilst Emery Down is well-known for its pretty church, its alms houses and as the birthplace of New Forest snake-catcher Brusher Mills. Allum Green is the smallest of the four hamlets, and is perhaps the least well-known. It really is ‘off-the-beaten-track’, but it has a history that goes back to Domesday. Swan Green, meanwhile, has a picturesque cricket pitch and perhaps the most photographed thatched cottages in the whole of England. A bridleway winds over the hill to Emery Down, but this is not just any old bridleway. It borders the old Manor of Minstead, and retains to this day a 19th century Manor of Minstead boundary stone by the trackside. The Manor dates back to at least the 11th century and it is tempting to suppose that the bridleway is of similar, or earlier, vintage. An old bridge, known locally as the Roman Bridge, is used to cross Highland Water, whilst the Cut Walk, an early 18th century route originally constructed to link Lyndhurst with Burley, is travelled between the Roman Bridge and Swan Green. The route includes magnificent, ancient, unenclosed woodlands and part of Highland Water, a beautifully high-banked New Forest stream. It also passes close to the Forestry Commission Reptile Centre where visitors have the opportunity of seeing adders, grass snakes, smooth snakes, lizards and more. Here, in recent springs and summers, visitors have also been able to view daily activity at the nest of a goshawk, a large, scarce bird of prey, via live film footage shown on a big screen. Usually open from late March or early April until September, admission to the Reptile Centre is free, although a contribution is requested towards the cost of providing car parking facilities. Then for those who appreciate refreshment along the way, the walk passes three of the areas most historic pubs – the Waterloo Arms at Pikes Hill, the New Forest Inn at Emery Down, and the White Swan at Swan Green.